We were over at the neighbors tonight to grab some sweet corn when a friends truck pulled up. The couple quickly stepped out of the truck holding a bucket that was duct taped shut. Quite a bit of duct tape, actually, had been used to seal the lid. “There are two of them in there. Be careful or they’ll jump right out on you.” We all gathered around ..
Bullfrogs. The couple had just returned from a trip to a place where, apparently bullfrogs are prolific and they were bringing two of them back for the neighbor boys. The couple laughed, letting them know they had named the frogs already. Bill and .. well, Bill and something else I can’t remember. Bill’s name sticks with me because he pretty much was the center of attention .. and not just ours. The cat’s as well. And, Bill did make a run for it at one point. Heck, what frog wouldn’t. While one might think Bill would be safer in captivity with the cat around, perhaps the cat is one the one better off with Bill having a wall between them. From what I heard tonight and from what little information I skimmed over in even trying to be sure bullfrog is one word versus two, Bill could probably eat that cat for dinner. 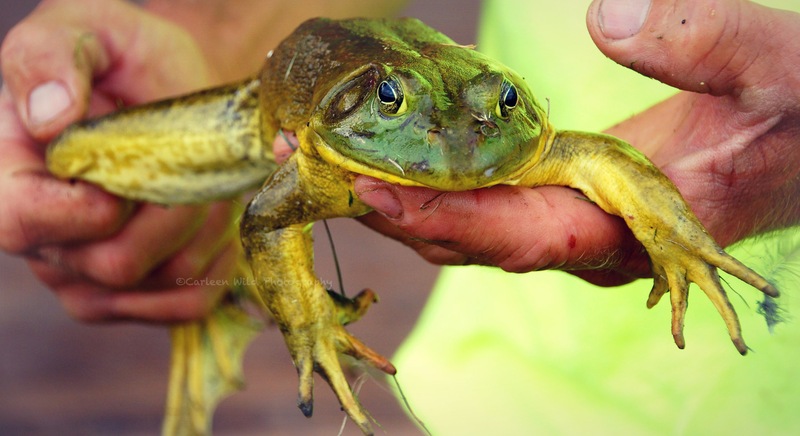 This entry was posted in Bullfrog, Cowboy, Photography, Uncategorized and tagged Bullfrogs by Carleen Wild. Bookmark the permalink.